Max has a few costume changes in the film, but 4 things remain constant: leather trousers, sweatshirt, leg brace and survival bracelet. The shirt appears to be a khaki waffle-knit thermal shirt, with the sleeve hems cut off and the front of the collar cut off. The shirt looks like it was weathered with a black wash, which can be achieved by pouring a little watered-down hot black dye or dark brown dye over the shirt while it’s hung up. As a human blood bag, Max is forced to wear a muzzle made out of a garden fork. Here is a Halloween version of one. Don’t forget some plastic chain. See the Muzzle Gallery for more reference photos. Max wears a black Condor MA1 tactical MOLLE platform with a Condor holster in the final scenes. Max wears a number of different boots. In the Intro scene, they are replicas of the trilogy Rossiter boots. After Nux steals his right boot and jacket, Max the Blood Bag is fitted with a lace-up boot. 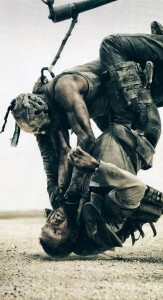 Slit manages to take it off of his foot as he slips off into the sandstorm (which he later boastfully holds up to Immortan Joe in hopes of joining him and Nux over the road block). After Max wakes up in the sand and tries to free himself from Nux, he takes his boots back. And then after Max finishes off the Bullet Farmer, he comes back wearing modern tactical boots, which are Under Armor Valsetz boots in Timber. To complicate things, production had a pair of odd-looking Rossiter-style boots made for Tom Hardy. They are disguised Reeboks (since Hardy apparently likes Reeboks). The boots have flat rubber soles, have no side tabs, have zippers on the insides, and they appear to be taller than Rossiter boots. I assume they were created for either comfort, convenience, or safety reasons (or all of the above). You can see Hardy wearing them a lot in the film. The faithful replica pair of Rossiters have only been spotted in the intro scene, on gas pedal close-ups, and in a quick, low shot showing Max approaching the War Rig on-foot for the first time. 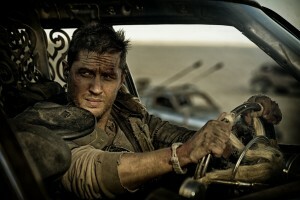 Tom Hardy’s Max wears a jacket styled after the trilogy’s Max jacket as it appeared in Mad Max beyond Thunderdome, with the thick black stitching on his left shoulder (bearclaw mohawker damage from Mad Max 2), his collar, his shoulder seam, his elbow, and a few stitches where his sleeve zipper used to be. The jacket zipper’s right half is still missing/cut out, but the left half zipper appears to have all of its teeth (as opposed to the Thunderdome jacket). Pocket zippers are gone. One thing that has disappeared is the police name tag. He wears the jacket in all scenes, except for the Blood Bag scenes, and doesn’t put his jacket back on until the War Rig is on its way to the canyon. The shoulder pad is a permanent part of his jacket, and is a replica of the trilogy version, with some noticeable differences. The Rawlings replica plate is significantly thicker, possibly the result of a one-part molding process and/or a desire to create a durable resin cast (the original was ABS plastic). The front of the plate in particular looks very rounded on the edges and the plate appears to be larger as a result of the extra material used to thicken the underside. Some photos suggest the plate could have been covered in leather. One Hollywood prop maker who has seen the plate said he recognized the plate material immediately as Kydex, textured side up, and then sanded down. He claims the edge abnormalities are just from a bad pull. The soft arch padding has a rounder protrusion at its apex, and is devoid of any top stitching. The vinyl collar appears to be thicker. The underarm strap looks similar, except for the buckle. Instead of a Rossiter-style roller buckle, there is a plain, flat center bar buckle. 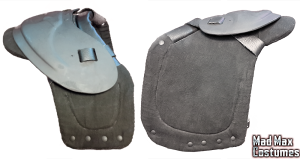 For more info, see How to Make a Max Shoulder Pad ADVANCED version. The trousers are black leather trousers with no back pockets, cut in a jeans pattern. Thick black stitching holds a crude leather flap on over the fly. There is some repair stitching on the right upper thigh. The inner seam of the left leg has stitching running along it, and there’s a seam over the left knee with stitching repairs. Max’s leg brace is made out of a real leg brace. It looks like a variant from the Donjoy Armor line. The covers over the hinge were removed, and straps were replaced with brown leather straps. For reference photos of the leg brace, see the leg brace gallery. Paracord survival bracelet with a lanyard knot closure. Foliage green. Here’s a Mad Max Fury Road fan and Etsy seller that offers exact bracelets (down to the right style knot) made to your measurements. 1. Intro (intro scene and on the way to the Citadel). Dubbed “Grizzly Max” by fans. Check out the Grizzly Gallery. 2. Blood Bag (his time inside the Citadel to right after the sandstorm). 3. Pre-Bog (from when he fights Furiosa to when he finishes off the Bullet Farmer). 4. Final (After finishing off the Bullet Farmer until the end of the film). Max wears the Ripsaw Imperator’s tactical vest in the final scenes. It is a modified South African M83 battle jacket with a knife attached and filled with various magazines and ammunition.